Pietro Cesare Alberti, it is told, was the son of Andrea Alberti, Secretary of the Treasury of Venice and Lady Veronica; and was baptized on 20 Jun 1608 in the Parish Church of San Luca in Venice. As aide to Captain David Pietersen of the dutch ship "King David", sailing from Texel, Holland (now a small island off Northern Holland and then a booming port of the Dutch West India Company), Peter Caesar Alberti was the only Italian crewmember aboard. It is thought that the young Italian nobleman had formed associates with Dutch troops then stationed on Malamocco, an island off Venice. Between 1609 and 1632, there was a commercial understanding between the two maritime nations of Venice and the United Netherlands, whereby Dutch troops were employed by the Signory. Having negotiated an officer's rank for himself aboard a foreign flagship, Alberti sailed for the New World on 10 Jul 1634. When the "King David" landed in New Amsterdam on 2 Jun 1635, Peter Caesar Alberti was ready to leave the ship, as there had been a dispute between himself and the Captain regarding wages. Before reaching New Netherlands, the ship had voyaged down the West Coast of Africa past the mouth of the Congo, across the Atlantic to Brazil, to Cayenne, Guiana, to the West Indies and then to Virginia. The Captain had threatened to land Alberti in Cayenne, Guiana, but Alberti hung on until the final port of New Amsterdam, where he promptly left the ship. Alberti is said to have sued the Captain and finally reclaimed part of his unpaid wages. Needless to say, Pietro Cesare Alberti was the only Italian in the city of New Amsterdam His name became quite mangled by the Dutch Scribes. On the public records he acquired several orthographic mutilations, which account for the varied spellings of ALBERTI today. He was styled as: Cicero Piere, Cicero Alberto, Peter the Italian, Caesar Albertus, Pieter Mallenmook, etc. In the course of several generations, his descendants were generally called by the surname Albertus, finally Burtus and Burtis, which was finally Anglocized to Albertis, thus retaining the original Italian name Alberti. By 1639, four years after his arrival, Peter Caesar had contacted a Pieter Montfoort, a large tobacco landowner, with whom he negotiated for a portion of the former's land. This was at Wallabout, on Long Island, within the present city limits of Brooklyn. Four years later Alberti secured a deed of ownership for the land from the Director General and Council of New Amsterdam then the legal government. In 1647 more land was granted by the Dutch West India Company. With this land and a patent for an adjacent piece of land, in 1647 Alberti owned the equivalent of a 100 acre farm, today an area from the Fort-Green section of Brooklyn to the Brooklyn Navy Yard. On 24 Aug 1642, Peter Caesar Alberti married Judith Manje, also spelled Magnee, (also recorded as Jans) daughter of Jean Magnee and Martha Chambert, both originally Walloons from Flanders and influential Dutch settlers. The bridegroom Alberti then inherited a large home alongside a canal which ran through the present Broad Street in Manhattan. In 1646, the Alberti-Manje family abandoned their home on Broad Street and moved to Alberti's plantation property on Long Island. Seven children were born to them between the years of 1643 and 1654. One died as an infant, but the other six were still alive when both Peter Caesar and his wife Judith were killed in an Indian raid in 1655. The Dutch authorities took charge of the six living children, appointed a guardian, and made a favorable lease of the plantation on Long Island. The records show that all of the children married. In 1695, two of the sons, Jan and Willem, sold the Alberti Plantation, and the land started the slow passing of hands down through the centuries. 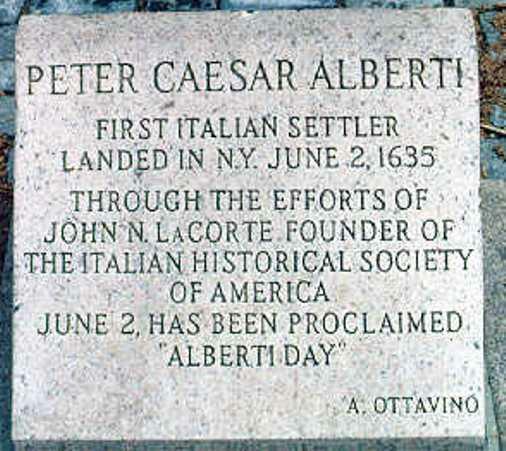 It is well established that Peter Caesar Alberti was the first Italian settler in New York state and the first Italian family to throw in his lot with the infant colonies that were to become the United States of America, together with many Italians who have come to this country since that time.